Championships, March 20-22, in Oklahoma City. WIN Magazine will preview this weight class as well as update brackets and provide notes and quotes during the tournament. 3rd Place — James Green (Nebraska) major dec. Ian Miller (Kent St.), 13-1 — The number one seed scored back points in all three periods — including a tilt off a suicide roll in the second period — and added a 5:44 riding time advantage. 7th Place — Isaac Jordan (Wisconsin) dec. Anthony Perrotti (Rutgers), 2-0 — The Badger scored on an escape in the second period and added a 1:45 riding time advantage by controlling Perrotti the entire third frame. No. 9 Dylan Ness (Minnesota) dec. No. 4 Ian Miller (Kent State) 6-4 — With :34 seconds left in the bout, Ness cut the corner on a double to give himself a 5-4 lead. He added 1:27 of riding time. No. 3 Alex Dieringer (Oklahoma State) dec. No. 7 Brian Realbuto (Cornell), 7-4 —Dieringer got two takedowns and a second-period reversal after Cornell freshman Brian Realbuto fell out of position after a takedown. No. 9 Dylan Ness (Minnesota) pinned No. 1 James Green (Nebraska), 3:36 — Just when it appeared that a reversal by Green put the Gopher on his back, Ness used his well-known “elevator” move to reversal the Husker to his back and eventually score the fall. Before this crazy second period, Ness ended the first period by scoring a takedown with one second left. No. 4 Ian Miller (Kent State) dec. No. 5 Isaac Jordan (Wisconsin), 6-2 — The Golden Flash scored a takedown in both the first and third periods for the victory. The Badger scored his points on a takedown in the third period. No. 3 Alex Dieringer (Oklahoma State) dec. No. 6 Taffur Nestor (Boston U. ), 18-11 — The Cowboy broke open a tight 12-11 third-period lead by scoring a takedown, three-point nearfall and a 2:05 riding time advantage in the final 1:20. Taffur scored the first takedown five seconds into the bout before Dieringer fought back to lead 10-3 on a pair of takedowns and two nearfall situations. But the Terrier did not quit when he scored an escape, takedown and two-point nearfall to cut the first-period margin to 10-8. No. 7 Brian Realbuto (Cornell) dec. No. 2 Derek St. John (Iowa), 11-4 — Leading 2-1 after a first period takedown, the Big Red freshman slammed the door on the 2012 national champion in the final minute; first by by putting St. John on his back for a three-point nearfall and 5-1 lead, then clinching the match with another takedown and a 1:26 riding time advantage. • Trailing 10-8 with 30 seconds left, Boston University’s No. 6 Taffor Nestor first scored a takedown off a long scramble and put Indiana’s No. 11 Taylor Walsh on his back and eventually scored a fall with two seconds remaining. • Minnesota’s Dylan Ness recorded his second straight fall when, after leading 10-7, pinned Oregon State’s R.J. Pena in 5:45. • The only upset at this weight came when The Citadel’s Aaron Walker pinned No. 15 seed Cody Pack of South Dakota State in 5:25. • This weight featured the most falls as five wrestlers flattened their foes. In addition to Walker’s pin, this list included No. 5 Isaac Jordan of Wisconsin (1:26 vs Army’s Paul Hancock), No. 6 Nestor Taffur of Boston U. (1:11 vs. Clarion’s Austin Matthews), No. 9 seed Dylan Ness of Minnesota (3:56 vs Ohio U’s Spartak Chino) and No. 11 Taylor Walsh of Indiana (2:19 vs. Alex Hudson of Chattanooga). 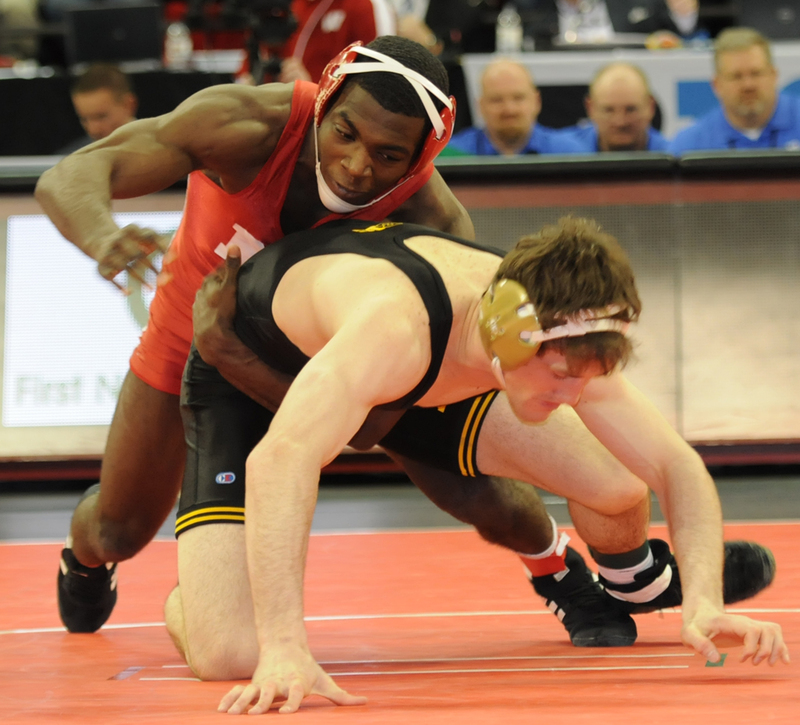 Nebraska’s James Green (top) defeated Iowa’s defending champion Derek St. John twice this season, including in the Big Ten finals. After finishing third and second, Iowa’s Derek St. John finally won his coveted national championship last March. This year, the Hawkeye senior returns as the No. 2 seed after losing to top-seed James Green of Nebraska in this year’s Big Ten final. The Husker is a two-time All-American and is 9-4 in two NCAAs, but seven of those victories came in wrestlebacks. The one wrestler who defeated both Green and St. John this past winter is Wisconsin freshman Isaac Jordan, the son of former Badger national champion Jim Jordan. Meanwhile, Oklahoma State’s No. 3-seed Alex Dieringer, who finished third in last year’s NCAAs, is coming off a Big 12 championship. His only regular-season loss came to Iowa’s St. John. Boston University has not featured an All-American since Grant Johnson finished fifth at 177 pounds in 1997. The Terriers, whose future as a program has been threatened by school administrators, are expected to add a fifth Top-8 finisher in Nestor Taffur, who is coming off an EIWA championship and is seeded No. 6. There are three returning All-Americans who’ve had plenty of ups and downs this winter. One is Oregon State’s R.J. Pena, who struggled at mid season, but the Pac-12 champion rallied to win 12 straight matches before the NCAAs. The other is Minnesota’s Dylan Ness, a national runner-up at 149 pounds, who lost three matches at the Southern Scuffle. Known as a dangerous scrambler, the Gopher came back to win several exciting bouts at season’s end, especially when he rallied to beat St. John in Iowa City. Penn State’s Dylan Alton, a third-place finisher in 2012, was limited to 23 matches this season after overcoming shoulder surgery in the postseason.